A Dutch baby pancake is a sweet popover baked in the oven. 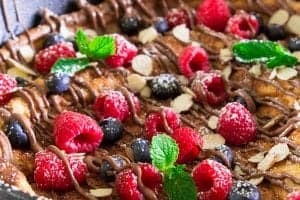 It’s typically served for breakfast with sweet lemon butter on top, but I topped mine with Nutella, berries, sliced almonds, and powdered sugar. You can honestly top it with whatever you like. A Dutch baby might look fancy, but it’s incredibly easy to make. Just blend all the ingredients in a blender and pour the batter into a heated cast iron pan. Place it in the oven and wait for all the magic to happen. When it comes out, it should be very puffy. The inside is moist like a pancake and the outside has a nice crunch to it. Pairing it with Nutella and berries is just pure bliss. 1 . In a blender, pulse the eggs, milk, sugar, flour, salt, and vanilla. 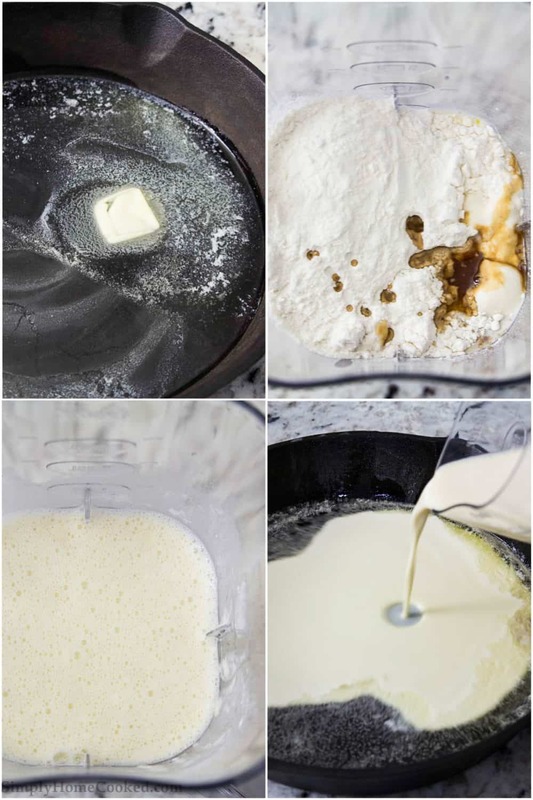 After a few pulses, scrape the sides of the blender to ensure that no flour is left behind. Blend once again until everything is well incorporated. 2 . Preheat the oven to 425 degrees Fahrenheit. Place a 10 inch cast iron pan into the oven for about 10 minutes. This step is crucial. Heating the pan before adding the batter helps create that puffy look of a Dutch baby. 3 . Pour the melted butter into the hot cast iron pan and swirl it around. Then pour in the pancake batter and place it back in the oven for about 20 minutes. Once it’s done, drizzle with Nutella and top with berries, sliced almonds, and powdered sugar. Serve hot. In a blender, pulse the eggs, milk, sugar, flour, salt, and vanilla. After a few pulses, scrape the sides of the blender to ensure that no flour is left behind. Blend once again until everything is well incorporated. Preheat the oven to 425 degrees Fahrenheit. Place a 10 inch cast iron pan into the oven for about 10 minutes. This step is crucial. Heating the pan before adding the batter helps create that puffy look of a Dutch baby. Pour the melted butter into the hot cast iron pan and swirl it around. Then pour in the pancake batter and place it back in the oven for about 20 minutes. 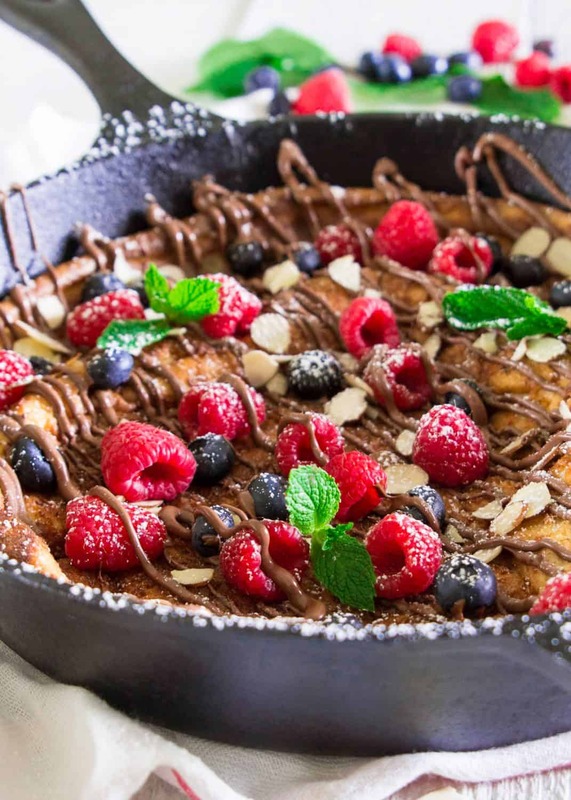 Once it's done, drizzle with Nutella and top with berries, sliced almonds, and powdered sugar. Serve hot. I have made this several times already and I love how easy it is to assemble! It literally took me a few minutes, Everyone loved it! I do have one question about the oven temperatures. I used the temperature given but my oven was on convection mode and when the outside looked perfectly done, the inside needed extra baking. Should I turn off my convection mode or do you have any other suggestions? This looks yummy. Does it slide easily out of the pan or do you just slice it up in the pan? Would stoneware cake pan possibly work? Hi Jessica, I’m not too sure what could be used in place of a cast iron skillet. A cast iron is used in this recipe for its durability and even heat distribution. I don’t know of any other pans that will do that. I’ve used a Pyrex glass dish before and it worked just fine.